There’s a funny picture of Mr. Rogers apparently flipping someone off on the internet. I took one look at it and knew perfectly well that wasn’t what was happening. Mr. Rogers give someone the bird? I don’t think so. I mean really, look at that smile. No – Mr. Rogers was singing “Where is Thumbkin?” a 50s classic. Speaking of getting to the point – the point of this post isn’t to educate you about Mr. Rogers or kid songs from the 50s; the point is to bring you up to speed on me. I have a broken thumbkin! On May 18 while on a group ride I slowed down at a stop sign and, as I was speeding back up, something happened and down I went. Another woman went down, too. It happened fast so who knows? I think she crashed into me and she thinks I wobbled into her but it doesn’t matter. What matters is that my thumb hurt like hell. Undaunted, I taped it on Sunday and headed off to swim Sharkfest 2013. 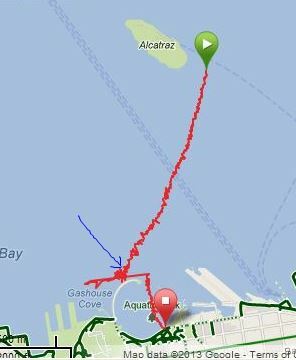 One thing I know about this swim, since I’ve done it a few times before, is that you must head to the left of the opening in the breakwater to get into Aquatic Park where it finishes. If you don’t, you get caught in a current that is, at best, really difficult to fight and at worst, impossible to fight. That arrow represents the point of no return. I saw that I was to the right of the opening and so I swam and swam and swam as hard as I could. I was okay with that because I figured it gave me lots of extra yards. At some point I looked up and realized that I was getting further and further and further away from the opening and then I looked all around me to see people in boats. Game over. I also got in a boat that took us over to the opening and then we jumped off and swam in. My time was not stellar but I didn’t really care. It was a beautiful day and I got in a beautiful swim and for a little while my thumb hurt a little less. Monday I made an appointment with an orthopedist and then Tuesday I almost cancelled it because “Hey! my thumb feels better!” but I reminded myself that I am not a doctor, nor do I play one on TV so I went. I had a big training weekend planned so I demurred on having surgery Friday, but Monday it is. And then Thumbkin will go back to jail for another month. That pretty red cast was waterproof so I could swim and workout on a spin bike and run. Hopefully, after my incision heals I can get another one of those for the last 2 weeks of Thumbkin Goes to Jail. Crossed fingers and prayers on that (if you are the praying type) would be most appreciated. Next up – my SF Half Marathon but I had to get up at 3:30 AM to race it so for now it’s nap time. ‘Night, internet people! This entry was posted in Racing, Swimming, triathlon. Bookmark the permalink. 3 Responses to Where is Thumbkin? Holy crap!! I’ll be holding good thoughts for you, for sure…owies!! 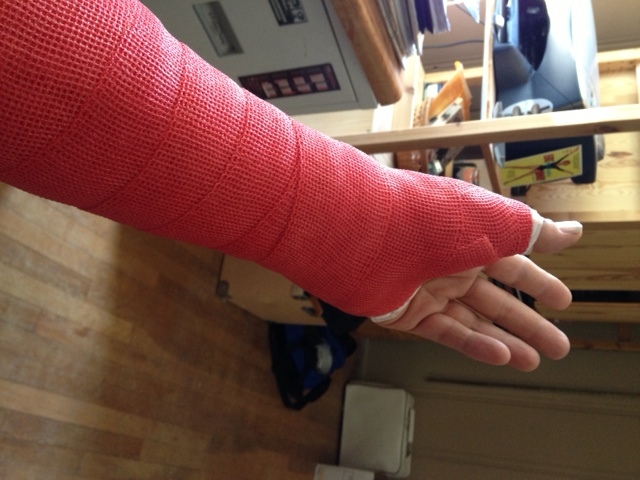 A swim, half marathon, continued training – all with a broken thumb? Wow, woman, you’re one tough cookie. Again, I’m so sorry. Hang in there. Oh, what a drag. I once stabbed myself with a wineglass stem and my thumb has never been the same, so I know what it’s like to have limited use of your thumb. I hope the surgery went well and thumbkin is good as new.